Born in Philadelphia to Russian-Jewish immigrants, Windsor “felt attracted to women from a young age but feared revealing herself as ‘queer,’” said The Washington Post. She married a male friend of her brother’s after graduating from Temple University, but they divorced within a year. 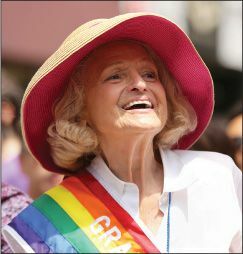 Windsor moved to New York City, she said, “to let myself be gay.” She joined IBM as a computer programmer in 1958, and five years later she met Spyer— a clinical psychologist— at a gay-friendly restaurant. They bonded over a love of dancing, and soon became an item. Inspired by the 1969 Stonewall riots, the couple “marched in gay pride parades, joined gay and lesbian organizations, and lived openly as lesbians,” said The New York Times. But “their lives changed irrevocably” in 1977, when Spyer was diagnosed with multiple sclerosis. As Spyer’s body “slowly deteriorated with paralysis,” Windsor became her full-time caregiver.